Over the years I’ve done a fair amount of writing on #NoEstimates. Here on uncharted waters, then again, over at CIO.com, and again, and a few other places, here or there. I organized a couple of discussions at the Agile conference, one of them on the formal program. Then, somewhere along there, I just … stopped. Perhaps it was because of the vitriol in the discussions. Two sides entrenched, not listening to each other, is not my idea of a fun time. Perhaps it was because of how little actual change I saw happening, the vast distance between the idyllic business novels and my clients. I saw some benefit to the predictive modeling work of Troy Magennis and Steve Rogalsky, and had some success myself in that area, but found myself slowly abandoning the hashtag. After thinking deeply for a few years on the topic, and taking a couple years off, an idea or two has started to bubble in my mind. I’d like to tell you about it. Right now, all over the world, there are a thousand people bent over a keyboard, working on that first (or second) (or third) novel. Plenty of them don’t know when they will finish, and they are fine with just working through the process. The same can be true of start-up businesses launched on nights and weekends. Google’s famed twenty percent time, doesn’t require deadlines or projects. It was also credited with spawning Adsense and Gmail, each of which led the growth of the company when they were developed. Over the years at work I’ve had a number of “spare time” activities, some without deadlines, in an environment of trust. The experience of a boss asking for a task to be attached without setting a deadline certainly isn’t unique; one of my older articles is about five contexts where #NoEstimates could work. Let’s step back. Take a look at all software projects. Turn your head and squint. What makes #NoEstimates so obvious in some contexts and so “impossible” in others? There might be better terms for these, but for now, let’s say motivation is personal commitment to getting the job done, while risk is risk to the organization’s survival. When google instituted 20% time, it was so profitable, and growing so quickly, that even if the 20% time returned no benefits, the organization would still do just fine – risk was low. The same is true for the startup-programmer who has a day job, the waiter writing a novel in his spare time, and the “part-time side project” the boss assigns. The high-motivation, team-spirit projects that have organizational risk probably do need more overhead, which is probably the land of modern planning practices like Yesterday’s Weather and counting stories. Finally, we have high-risk and low motivation. This is the land of no-trust, of CYA, of gannt charts and project plans and heavy observation to make sure people are “really” working. Perhaps, in these environments, a heavy hand is called for. There are different management techniques in these sorts of environments, and some do work better than others. For this blog post, I think it’s safe to say this is a tricky problem, and that most of the people saying “#NoEstimates could never work” come from here. 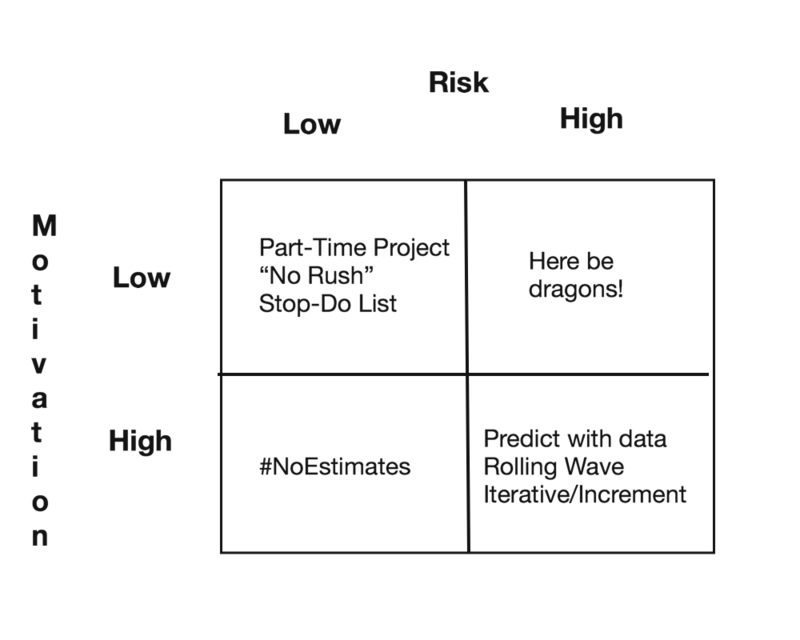 First a warning: For now, the #NoEstimates matrix is more thought experiment than defined “law of software.” For example, the current verson only identifies two variables, and there are more than two variables in life. Reward is left out of the equation — it might arguably add a third dimension to the matrix. You could add complexity as well, and there are certainly others. Then another: The temptation with this sort of approach is to select a category and have the tool tell you the correct choice. When she review the matrix, Kate Falanga pointed out that the “part time/small” projects are often the ones that are most likely to be planned improperly, and run over budget, perhaps to the point of becoming higher risk. Finally, a thought. Sure, you can take a look at this matrix and compare it to your portfolio to spark conversations about the right kind of ways to run projects. But everytime risk is high or motivation is low, stop for a second and ask why — and what you can do about it? The real power might not be in choosing the “right” management style, but instead figuring out how to move the projects down and to the left. Matt, I'd suggest there are some other dimensions to the chart. Here's two fundamental ones in any business that has a fiduciary responsibility to manage the money provided by others (investors) or report to some external oversight organization (Board of Directors). What governance framework provides the ability to Not Estimate the cost and schedule of the future deliverables? If those two conditions are not present, then it may be that those providing the money truly don't have a need to know when the work will be done and what the cost will be when it is done. I'd suggest qualifying that condition first, then apply the matrix.